Clean, tidy and fast; not just good adjectives to describe your ideal car, these are ideal words to describe your ideal Mac, too. One big factor in making your Mac or your network secure is knowing what you’re trying to protect. In a more day-to-day sense, it’s about being able to find what you need and to get things moving quickly. 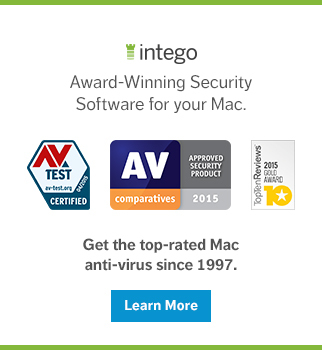 In order to do that, you need to be aware of and in control of what’s on your Mac. Washing Machine has a few ways of helping you do this. The new version of the product is broken up into three sections, to make it easier to do. This will be the first in a series of articles where we’ll break those three sections down, and show you how you can use them to get your machine zippy like it’s practically brand-new. The Organize cycle in Washing Machine is your key to an optimized desktop, organized for efficiency. Over time, we all create tons of files and a lot of us develop a habit of just dragging interesting things off onto the desktop, as we go along. The problem comes when we want to be able to find one of those interesting files that’s now under a stack of files six icons deep. Thing is, some of those files might actually be pretty important, or they might contain proprietary or personal information that you don’t want other people to be able to find or steal. Keeping your desktop organized for efficiency is also about the programs and files you use most being readily accessible. Washing Machine helps streamline and automatically organize your heap of desktop files into the right folders, so you can work smarter. It also shows you which apps you use most often and allows you to drag and drop them to and from your Dock with ease. Click the Organize cycle, select the Desktop category, and click the Tidy button at the top of the window. Now you can organize your Desktop by sending documents, images, music and movie files to either their appropriate Home Folders, a Desktop Archive folder, or the Trash. NOTE: With an easy method of dragging files into more appropriate folders, you can beat the procrastination-beast that keeps you from tidying up those giant stacks of files, and get better control of your data. You can manually drag and drop individual files and folders into three different sections at the bottom of the window, or you can let the Washing Machine Auto Select feature do all of the work for you. Once you've made your selections, click the Tidy button and a new window will appear confirming the move. Click Yes, and Washing Machine will begin organizing the items to their new locations. If you have chosen to keep files organized on the Desktop, double-click the new Desktop Snapshot folder to see the files. After organizing your desktop, there are other areas where your Mac could be a lot more useful, but that often get ignored. When you bought your Mac, it came with a bunch of stuff on the Dock, which you may not have ever touched. Wouldn’t it be nice to have just the programs you regularly use there, so you don’t have to go digging around in Finder or on the Command+Tab menu? 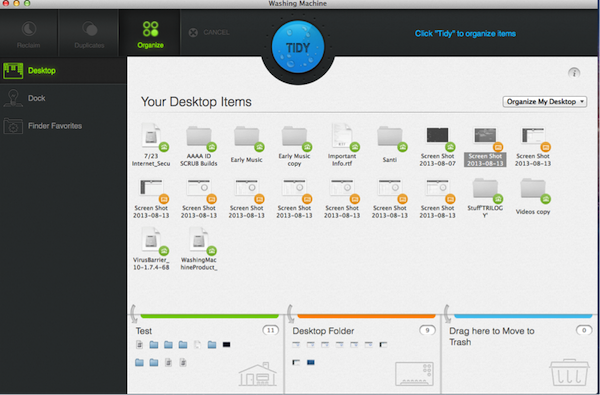 Washing Machine will suggest files for your Dock, based on your usage patterns, helping you organize your Dock. To organize your Dock with Washing Machine, click the Organize cycle button at the top of the window, and then select the Dock category. Click scan, and Washing Machine will display a list of all your applications. NOTE: Use the Auto Select feature to automatically fill the Dock with your most used applications. You can also manually drag to add or remove items from your Dock. You'll see your new Dock preview at the bottom of the window. All new icons will appear with a green plus (+) sign. Your new Dock is displayed at the bottom of the window. To remove an item, simply drag and drop its icon up into the top half of the window. To add an icon to your Dock, just drag it from the top of the window down into your new Dock. Again, you will see a plus (+) sign for any new applications that you've added. Once you have finished making your selections, click the Tidy button. 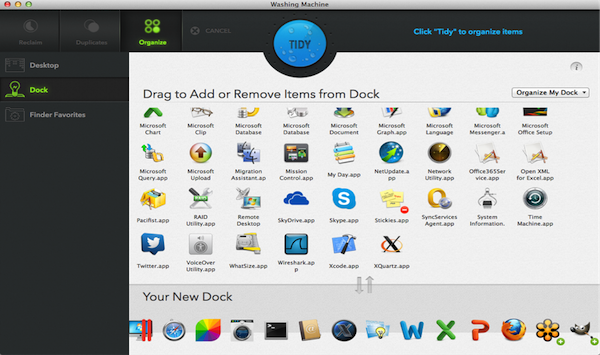 A new window will appear, confirming what items you are going to be adding and removing from your Dock. Click Yes in the bottom right corner to confirm. Your new and organized Dock should now appear. Do you ever wish you had more of those “Open Recent” menus on your systems, so you could more easily get at all those applications or documents you access all the time, rather than having to dig around or remember where things are? The Organize tab in Washing Machine can help you create Smart Folders that automatically bundle your most frequently used files and application—all in one place. Click the Organize cycle, and then select the Smart Folders category. Click the Scan button, and you will now see a list of all the available Smart Folders Washing Machine can create. NOTE: You can create a Smart Folder for all of your documents and spreadsheets, or all of your music and pictures. The included files are listed at the bottom of the window. To create a Smart Folder, simply drag and drop it from the left to the right side of the window. 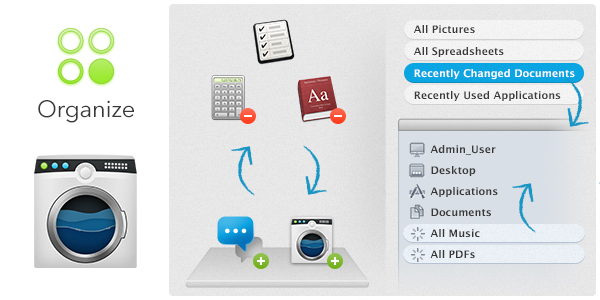 All of your new Smart Folders that are created will be available from Finder. Click the Tidy button once you're made your selections, and click Yes in the new window that appears to confirm the creation of your new Smart Folders. Now, open a Finder window and you'll see your newly created Smart Folders in the left hand column under Favorites. In our next installment overviewing Washing Machine, we'll examine the Duplicates cycle to see how you can scan your Mac for duplicate files and reclaim a boatload of disk space (and speed up your Mac) by getting rid of extra copies of files. 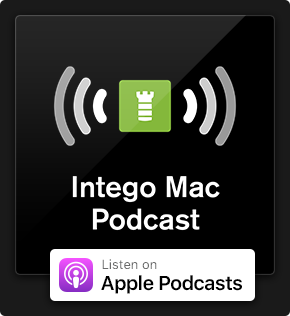 This entry was posted in How To and tagged clean, desktop, dock, Intego, Mac, Mac cleaner, organize, OS X, smart folders, speed, tidy, Washing Machine. Bookmark the permalink.